Every work environment needs to be prepared for accidents and this BSI First Aid Kit Large is the perfect addition. Suitable for use in schools, care homes and offices, this large kit is ideal for groups of 50+ people in low risk areas or 25+ people in high risk areas. The entire kit comes in the standard and recognisable green box which can be stored on any hard surface or mounted on to the wall. Ensure every cut, graze or more serious injury is treated instantly and effectively with this all encompassing kit. 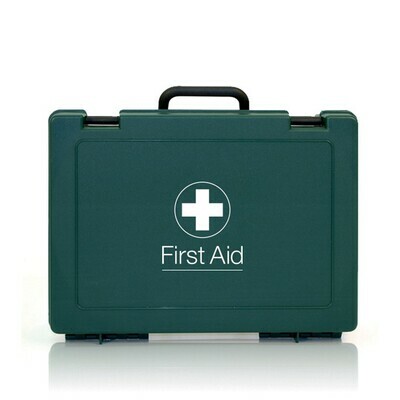 Here at Gompels, we have a wide range of First Aid options to suit all work environments. With everything from our BSI Travel Bag First Aid Kit through to our Burns First Aid Kit, you'll find the perfect option for your business.